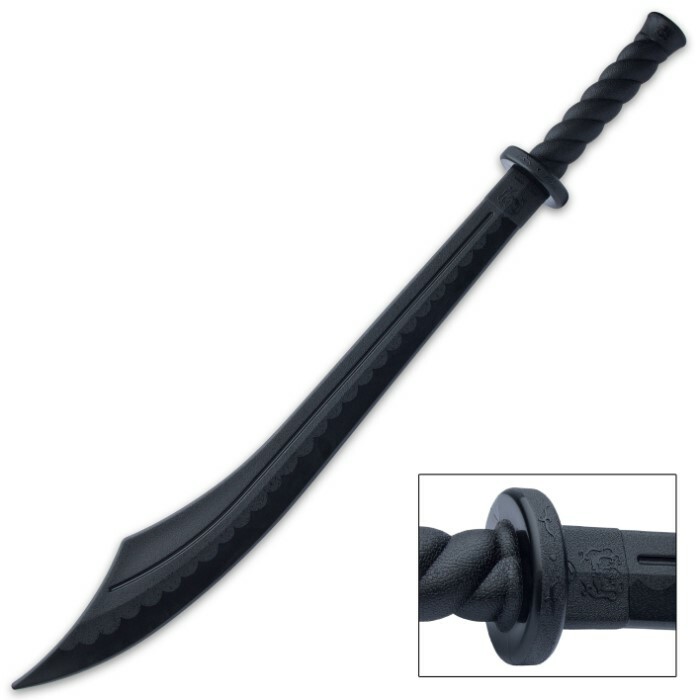 Polypropylene Training Broadsword Black | BUDK.com - Knives & Swords At The Lowest Prices! This polypropylene training broadsword is the only way to master sword fighting without the risk of injury. Each sword is constructed of high-impact resistant polyproylene that will withstand years of brutal combat training. Looks and feels just like a real Chinese broadsword, but it's safe for sword fighting. Love how the trainer feels and handles. Have owned it for four months and it has survived some rough training sessions with my buddies. Reason I’m giving it a three out of five is that the product I got, while similar, does not look like the product displayed, which I do not appreciate being lied to like that. As while the shape of the blade is relatively similar, it does not have the same grip, pommel, or handguard that is displayed. It also doesn’t have the same blade design as far as asthetics. I did not realize until I went to leave a review, and again, though the trainer is great, I don’t like to be lied to. I got this a few months ago and I have knocked down dozens of trees with it. It is very strong. With one extremely strong hit against concrete the blade only received a minor dent. The handle is very comfortable too. This sword also has a great weight to it. Over all I couldn't have been happier with this purchase. I hate to be the stickler, but this is certainly not a broadsword. If a name is to be given to this sword, call it a scimitar or a martial arts sword. However, the sword does some serious work and is totally worth the purchase! It has great arc in the swings and will not break on you, even if you swing it like a monster! Great sword, it is very satisfying to hit my friends with. Tough and sturdy sword with great handling, and I'm pretty sure if it hits you hard enough it could knock a tooth out. Also great practice weapon for sparing, and just for fun. I bought myself 2 of these because I favor 2 weapon fighting. I love them. They are noticeably heavier than my other polypropylene swords, but I have become accustomed to the weight and am better for it. Once you are accustomed to the weight these swords definitely give you an advantage in a sparring match. My partners weapons bounced off of mine leaving them open for a counter. I definitely recommend them to anyone. I just got this sword the shipping only took 4 days, so great shipping. to begin with this sword is awesome for sparring it has some weight to it the you will need armor to spar. The handle is great also the blade is very sturdy. Overall thanks Budk! great sword, love how it's light weighted and durable. This sword is very solid. My only wish is that it didn't scrape so easy. But only when you hit rocks. Its an awesome practice sword.